The weeks following July 4th out west is known as “Cowboy Christmas” for the number of rodeos that are held and available to participate in. 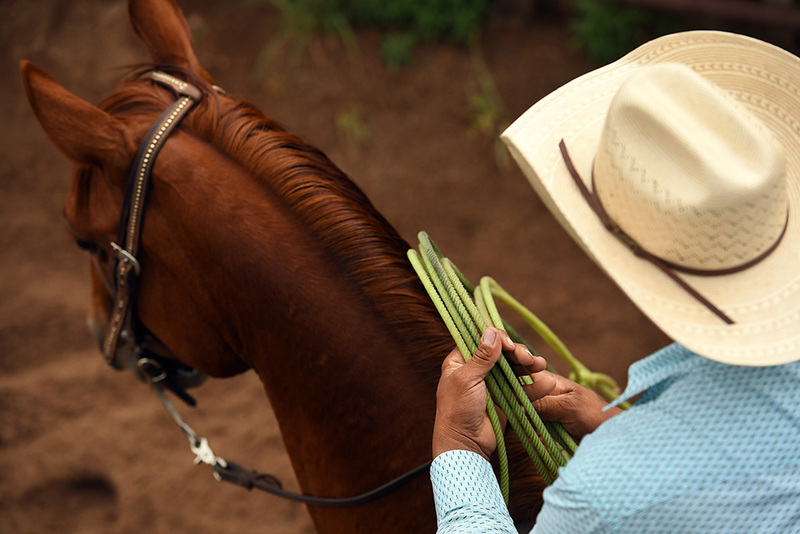 Rodeos have their root in working ranches that held competitions where workers could test their skills. 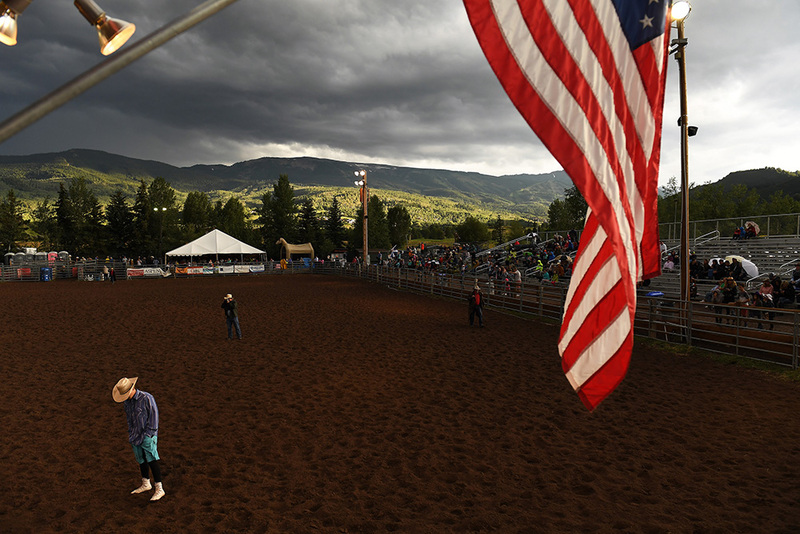 People gather under a threatening sky that produced showers during the Snowmass Rodeo on Wednesday July 19, 2017 in Snowmass Village, CO. 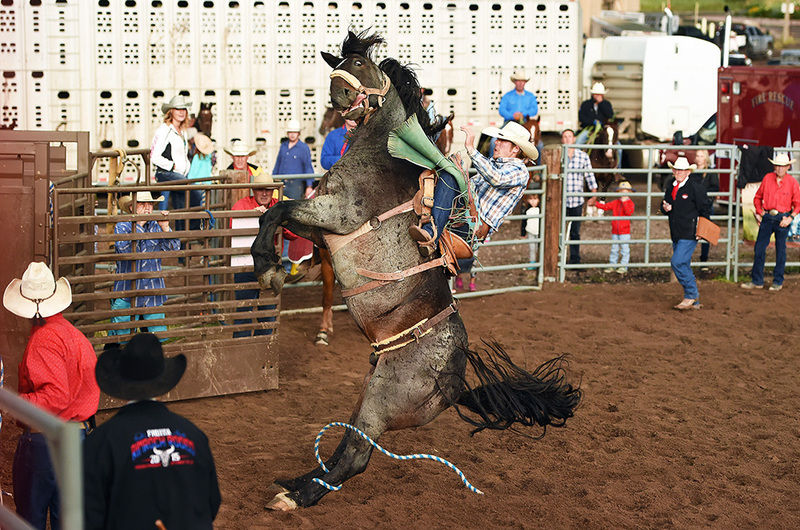 This is the 44th year for the weekly rodeo that runs from mid-June through August. BIG ISLAND, VA – JAN 20: Ben Wright heads up Hunting Creek Road through a cloud on Friday, Jan. 20, 2017 near Big Island, Va.
A participant in the Team Roping event prepares to compete at the Carbondale Wild West Rodeo on Thursday July 20, 2017 in Carbondale, CO. The weekly rodeo is in it’s 13th year at it’s current location. It runs from June to mid-August. Elvis Tribute Artist, Ron Tutor, 52, of Tinley Park, TN prepares to perform while listening to music in his Dodge Caravan outside the New Daisy Theatre during the Images of the King World Championship on Sunday August 13, 2017 in Memphis, TN. August 11-19 is Elvis Week. This year marks the 40th year since Elvis Presley’s death. 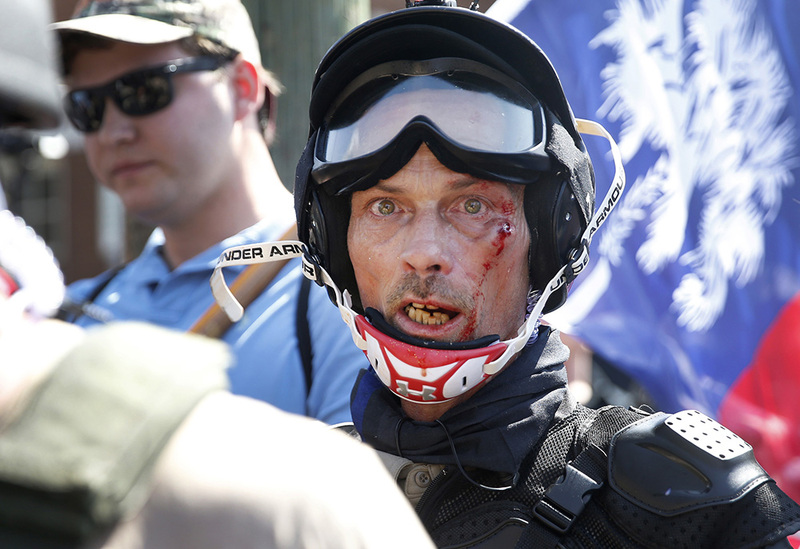 A person with Unite the Right in Charlottesville on Saturday Aug. 12, 2017. Unite the Right was protesting the changing of the name of Lee Park. 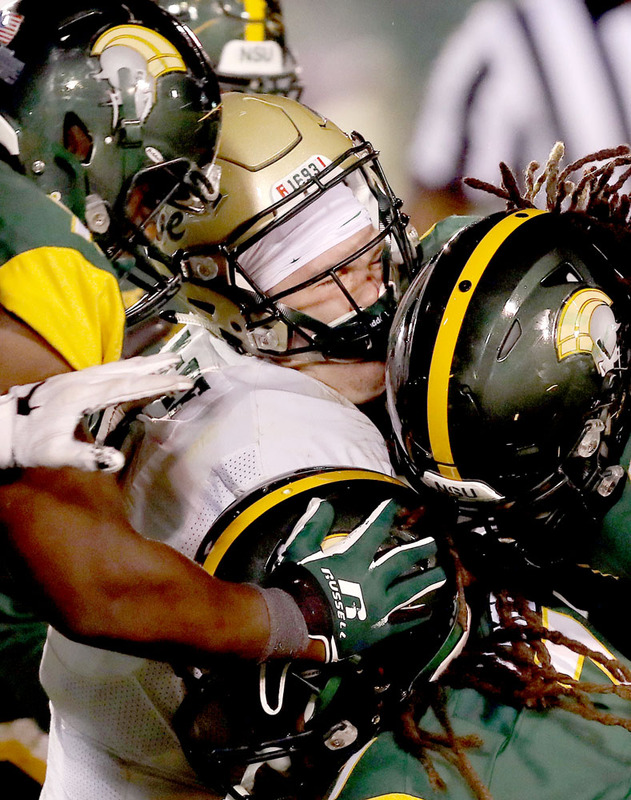 William & Mary quarterback Tommy McKee gets crunched by the Norfolk State defense as he runs during the fourth quarter Saturday September 9, 2017 at Norfolk. 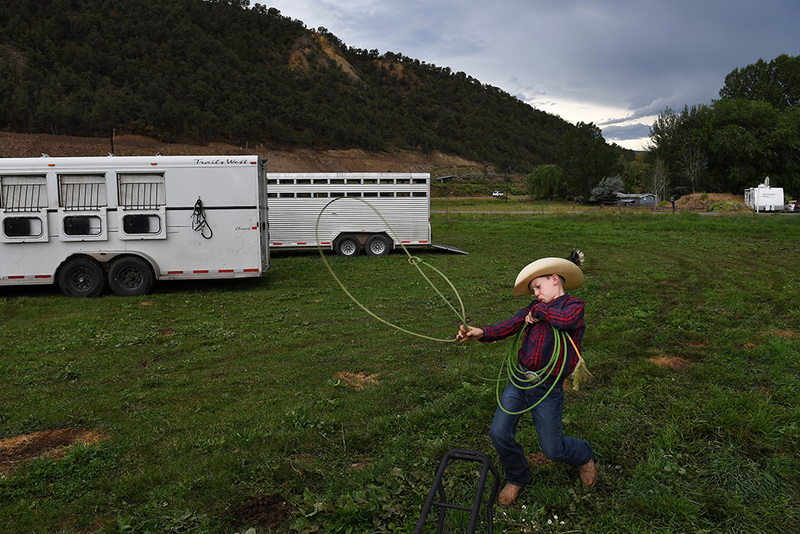 Clayton Rossi, 11, works on his roping skills before during the Carbondale Wild West Rodeo on Thursday July 20, 2017 in Carbondale, CO. The weekly rodeo is in it’s 13th year at it’s current location. It runs from June to mid-August. 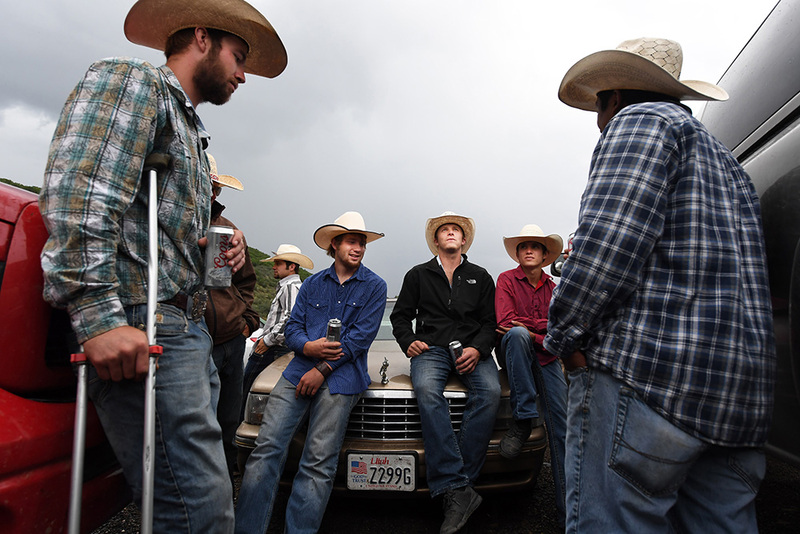 Strider Leverton, of Vernel, UT, center, gathers with other participants at the Snowmass Rodeo on Wednesday July 19, 2017 in Snowmass Village, CO. This is the 44th year for the weekly rodeo that runs from mid-June through August. 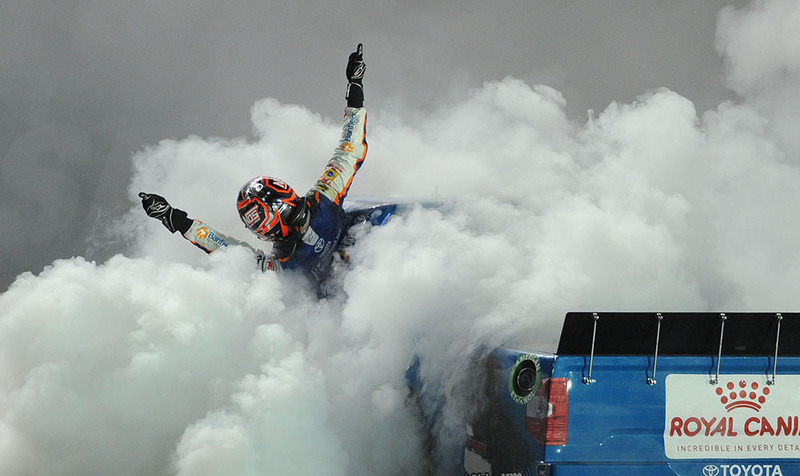 UNOH 200 Truck Race Winner Kyle Busch hangs out of his truck while performing a burnout after finishing the Rain Delayed race on Wednesday, August 16, 2017 in Bristol, Tennessee. 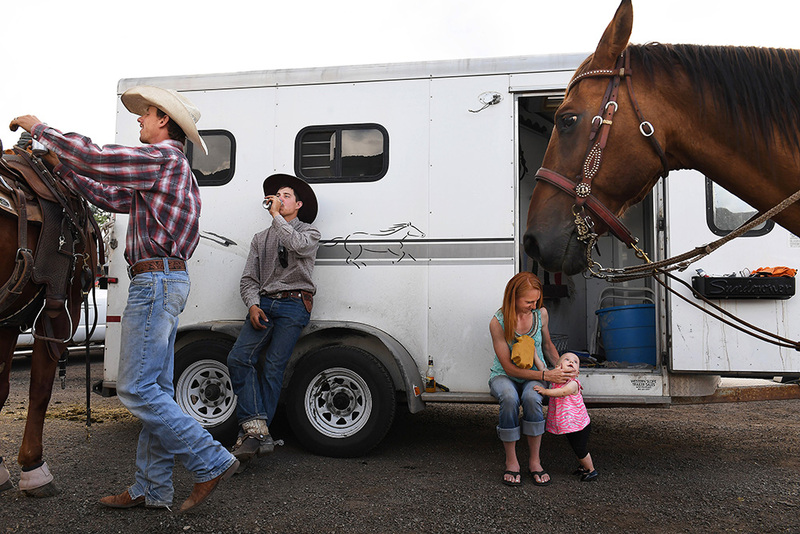 Evan Koster attends to his horse while standing next to J.D. Slagowski as Evan’s wife, Maggee Koster holds their daughter, Raelyn Koster, 1, prior to the start of the Snowmass Rodeo on Wednesday July 19, 2017 in Snowmass Village, CO. 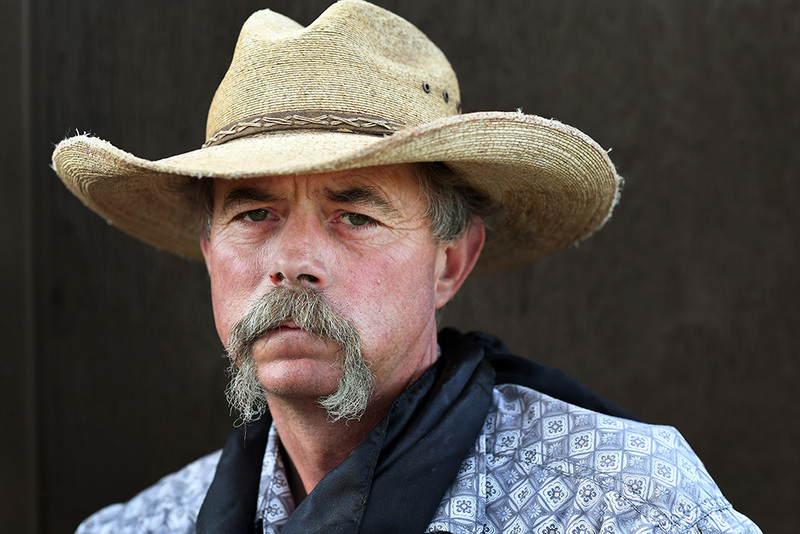 This is the 44th year for the weekly rodeo that runs from mid-June through August. 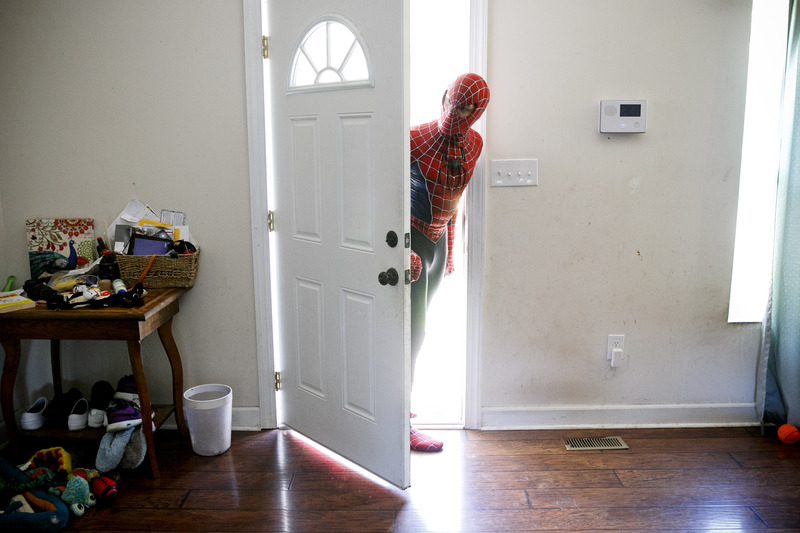 Donald Traynham, of Williamsburg, Va., dressed as Spiderman, peers through the front door at the home of Zack Cissell, on Friday, September 22, 2017 before they left for a charity event they were performing at that evening. The duo, along with Chloe Bethune, are all members of the The Hampton Roads Superhero Squad. Elvis Tribute Artists, Brett LeSueur, of Knoxville, TN puts his arm around fellow tribute artist, Travis Albertson, of Austin, IN as they perform in the backyard of Bud and Mary Stonebraker on Friday August 11, 2017 in Memphis, TN. The couple have lived directly behind Elvis Presley’s Graceland for 22 years. Bud refers to he and his wife as more Elvis fanatics than just fans. Their house is decked out with Elvis memorabilia. They hosted free concerts in their backyard during Elvis Week. Garrett Buckley competes in the Saddle Bronc Riding competition at the Snowmass Rodeo on Wednesday July 19, 2017 in Snowmass Village, CO. Buckley got another ride after this first ride ended quickly as the horse he was riding went straight up and over after coming out of the gate. This is the 44th year for the weekly rodeo that runs from mid-June through August. 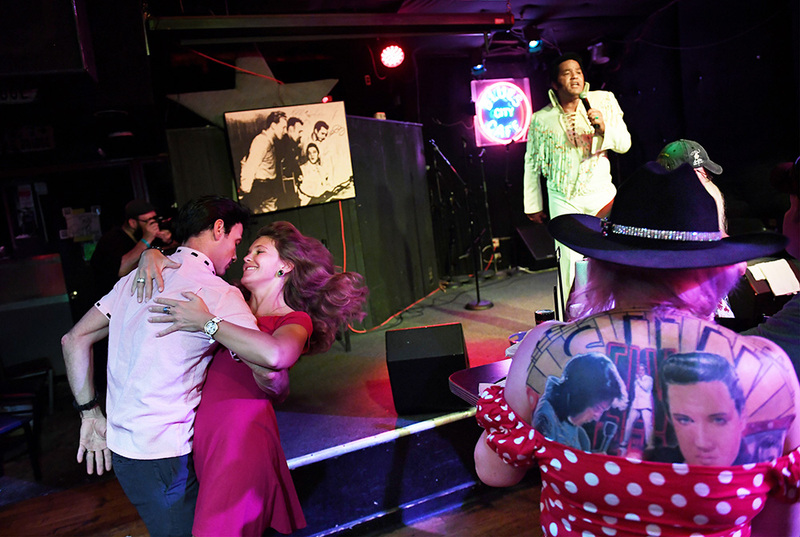 MEMPHIS, TN – AUGUST 14: Matt Joyce dances with Anne Kathrin to the music of Elvis Tribute Artist, Robert Washington while Amanda Dorrington, is seen at right at Blues City Band Box on Monday August 14, 2017 in Memphis, TN. August 11-19 is Elvis Week. This year marks the 40th year since Elvis Presley’s death. 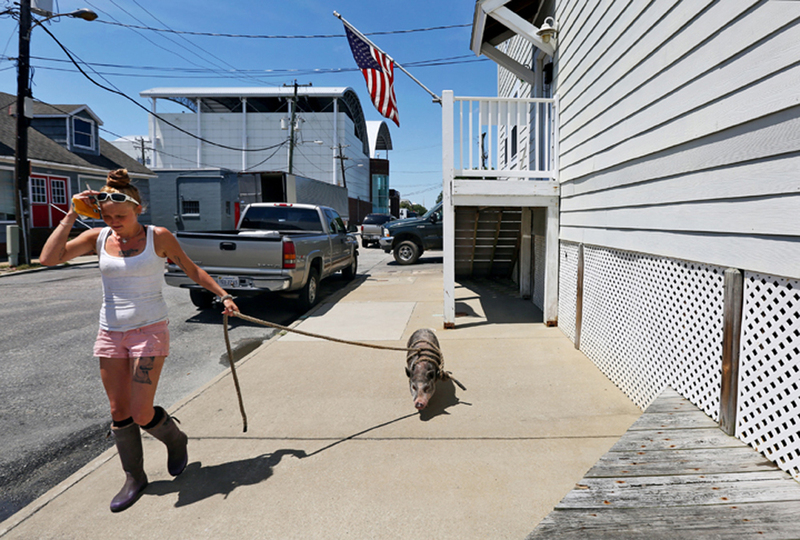 First Hand Stasia Hudson, walks along the sidewalk with Pig as she waits for the boat to be unloaded at L D Amory & Company fish market in downtown Hampton. 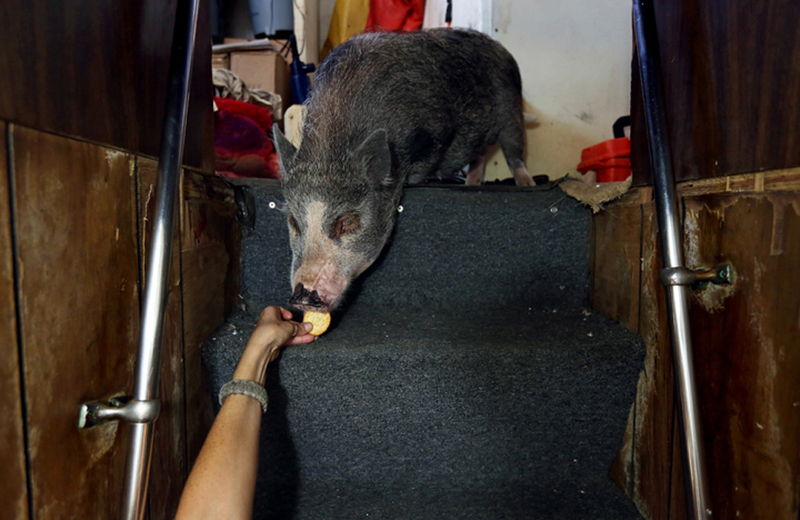 The 1 1/2-year-old potbelly pig is the resident pet of the ship and lives on the Carol Ann, a longline fishing boat, with the crew members while at sea. Wednesday, June 21, 2017. LYNCHBURG, VA – JULY 8: All-Area Boy’s Track Athlete of the Year Darrien Bradley poses for a portrait on Saturday, July 8, 2017 in Lynchburg, Va.
Zane Farris of Silt, CO poses for a portrait at the Snowmass Rodeo on Wednesday July 19, 2017 in Snowmass Village, CO. Farris was helping out at the rodeo. This is the 44th year for the weekly rodeo that runs from mid-June through August. 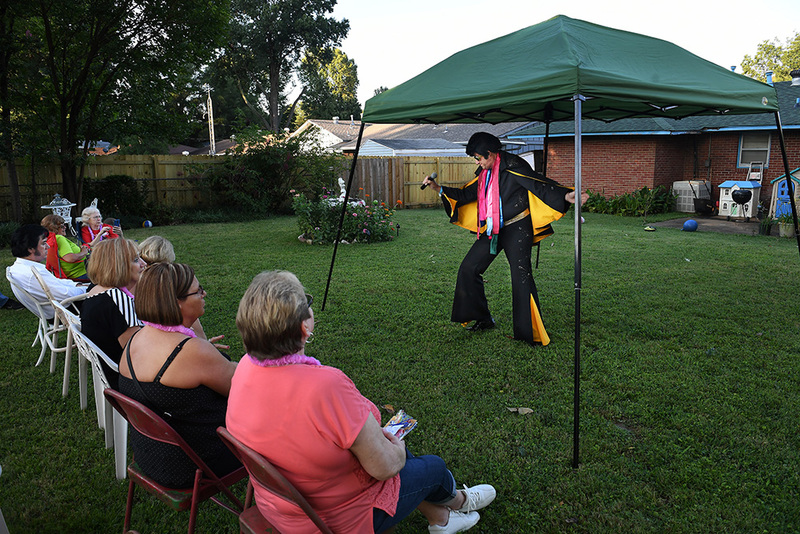 Elvis Tribute Artist, Bruce Hanson of Rice Lake, WI, performs in the backyard of Bud and Mary Stonebraker on Friday August 11, 2017 in Memphis, TN. The couple have lived directly behind Elvis Presley’s Graceland for 22 years. 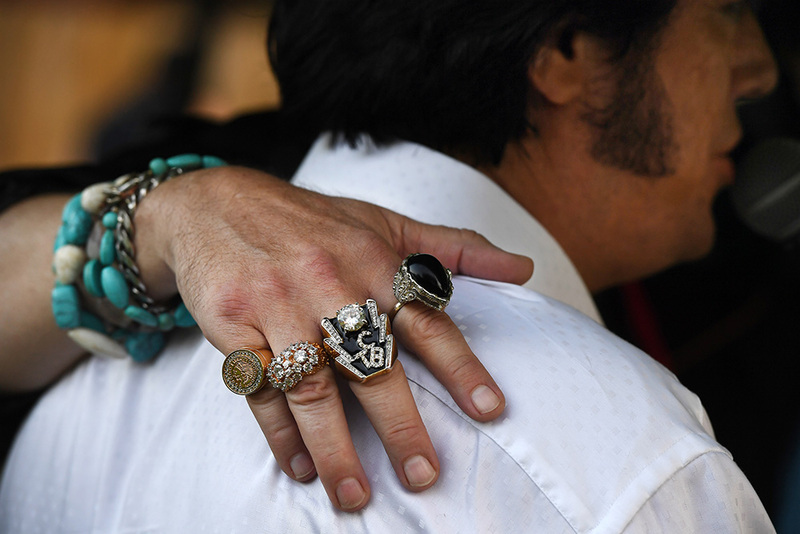 Bud refers to he and his wife as more Elvis fanatics than just fans. Their house is decked out with Elvis memorabilia. They hosted free concerts in their backyard during Elvis Week. 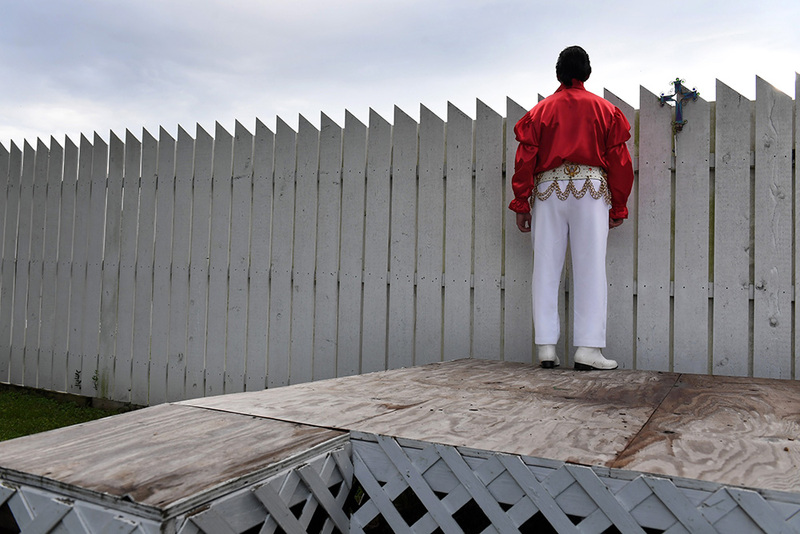 Elvis Tribute Artist, Jimmy Smith of Aiken, SC looks over a fence at Graceland from the backyard of Bud and Mary Stonebraker on Monday August 14, 2017 in Memphis, TN. The couple have lived directly behind Elvis Presley’s Graceland for 22 years. Bud refers to he and his wife as more Elvis fanatics than just fans. Their house is decked out with Elvis memorabilia. They hosted free concerts in their backyard during Elvis Week. An employee with L D Amory & Company unloads a delivery truck as the potbellied pig named Pig hangs out in the shade from underneath a truck. 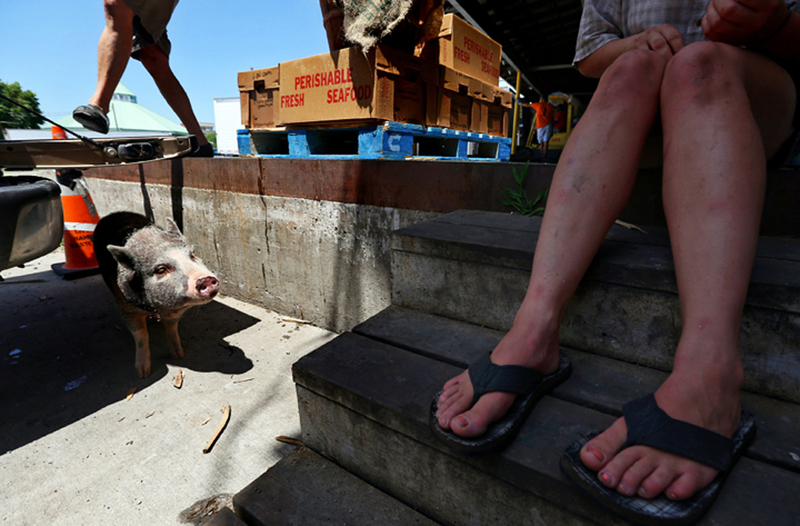 Samantha Huff, left, from Charleston Sc., sits on the steps, watching over Pig, as the crew’s longline fishing boat is unloaded in downtown Hampton. Wednesday, June 21, 2017. Violinist Kearston Gonzalez, left, and cellist Kendall Gonzalez perform to an audience gathered at the Tabb Library in York County Wednesday afternoon August 9, 2017. 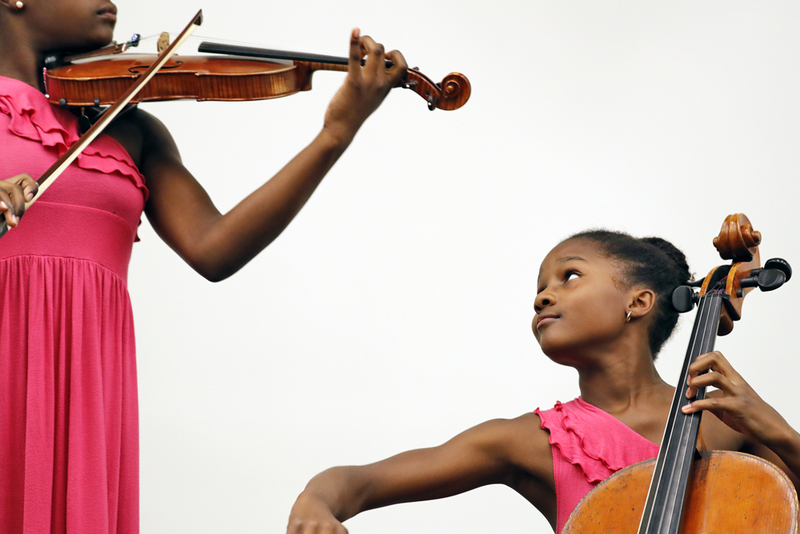 The sisters have performed at WNBA and NBA games in Washington, D.C., Charlotte and Houston and both have performed as a soloists with orchestras and won musical competitions. From below in the sleeping quarters, Stasia Hudson feeds a Ritz cracker to Pig while docked at the L D Amory & Company fish market in downtown Hampton. 4th. 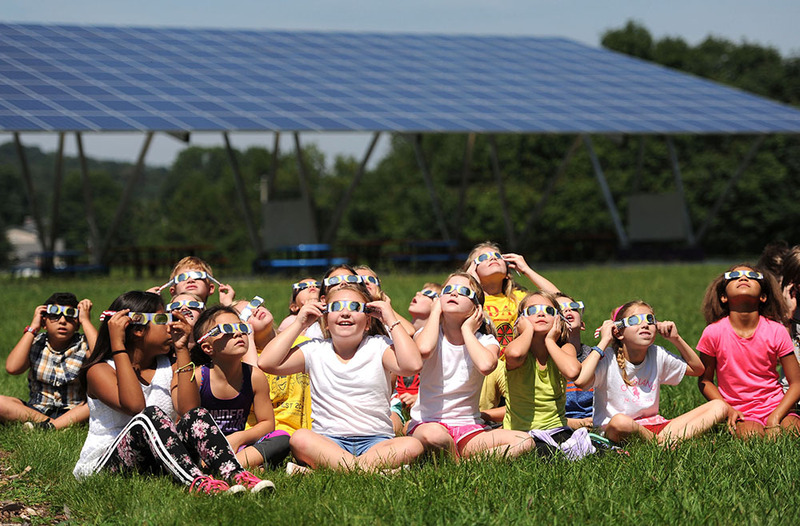 Grade students at Holston View Elementary School watch the solar eclipse outside Holston Elementary School on Monday, August 21, 2017 in the shadow of the school’s Solar Pavilion in background in Bristol, Tennessee. 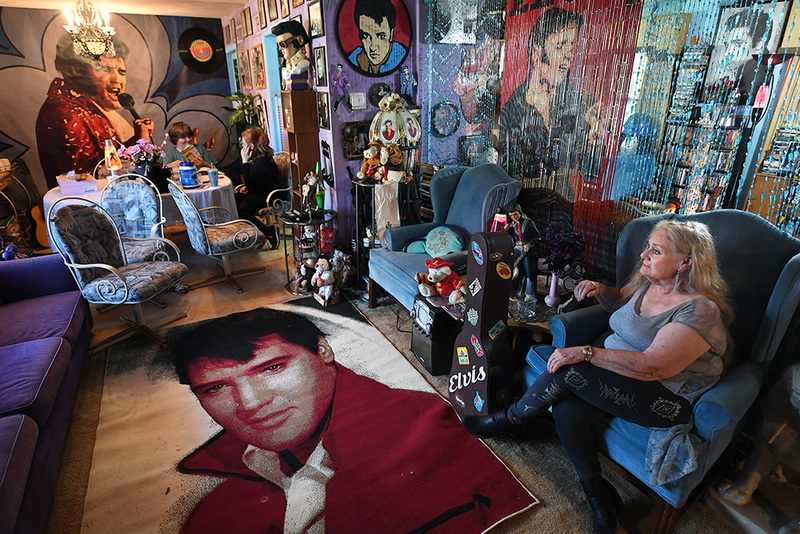 Mary Stonebraker sits in the living room of her home that is directly behind Elvis Presley’s Graceland on Friday August 11, 2017 in Memphis, TN. She and her husband, Bud Stonebraker have lived in the home for 22 years. Bud refers to he and his wife as more Elvis fanatics than just fans. Their house is decked out with Elvis memorabilia. They hosted free concerts in their backyard during Elvis Week. 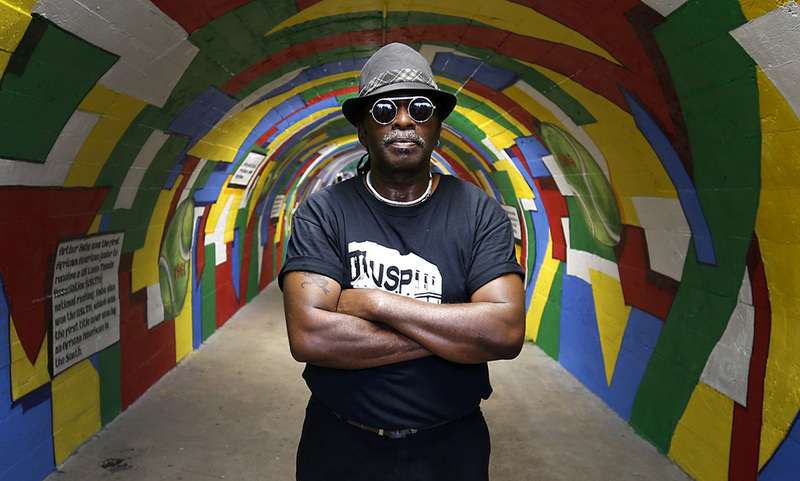 Artist Sir James Thornhill stands in the newly unveiled mural honoring Arthur Ashe at the pedestrian tunnel to Battery Park on Wednesday July 12, 2017. 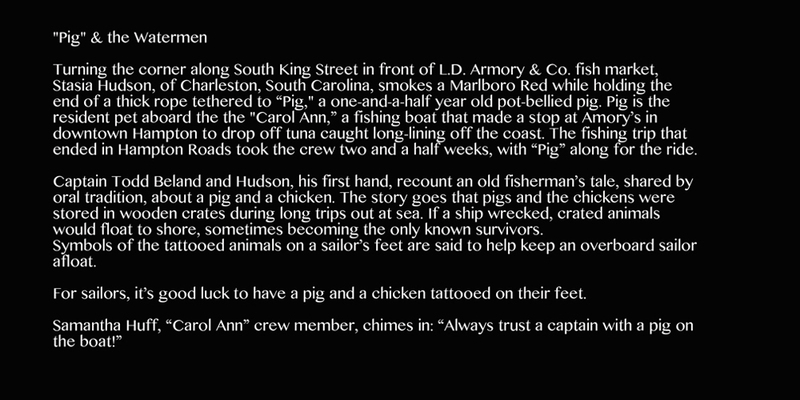 First Hand Stasia Hudson, pulls Pig while waiting for the boat to be unloaded at L D Amory & Company fish market. Wednesday, June 21, 2017. 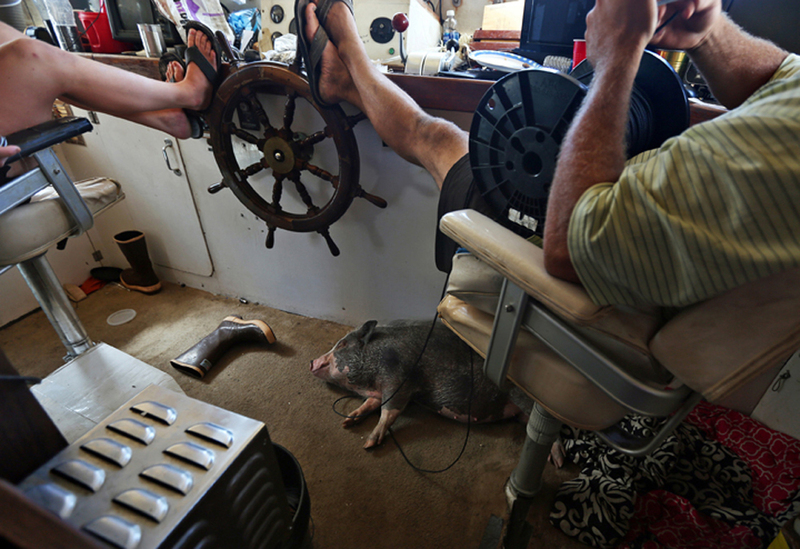 Samantha Huff, left, and Captain Todd Beland, right, take a break as Pig, the potbellied pig, sleeps underneath the ship’s wheel which docked in downtown Hampton on Wednesday, June 21, 2017. 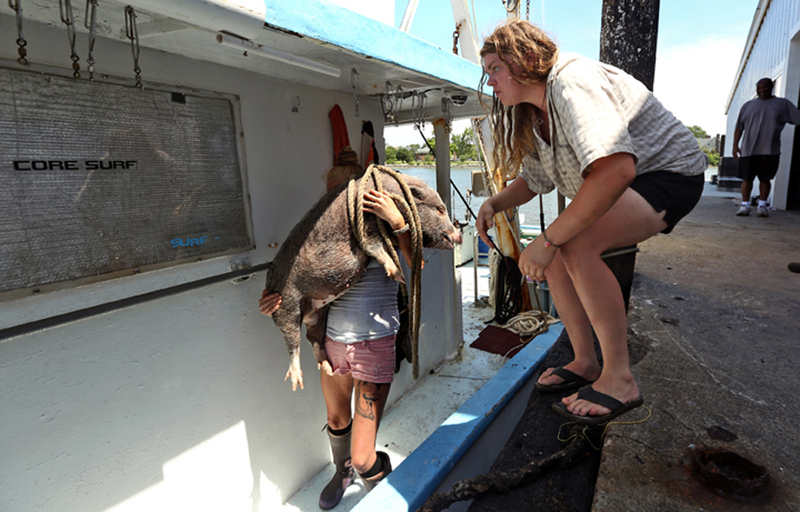 First Hand Stasia Hudson, left, lifts Pig into the boat with the help of shipmate Samantha Huff, right, while their catch was unloaded and processed at L D Amory & Company fish market in Hampton. Wednesday, June 21, 2017. 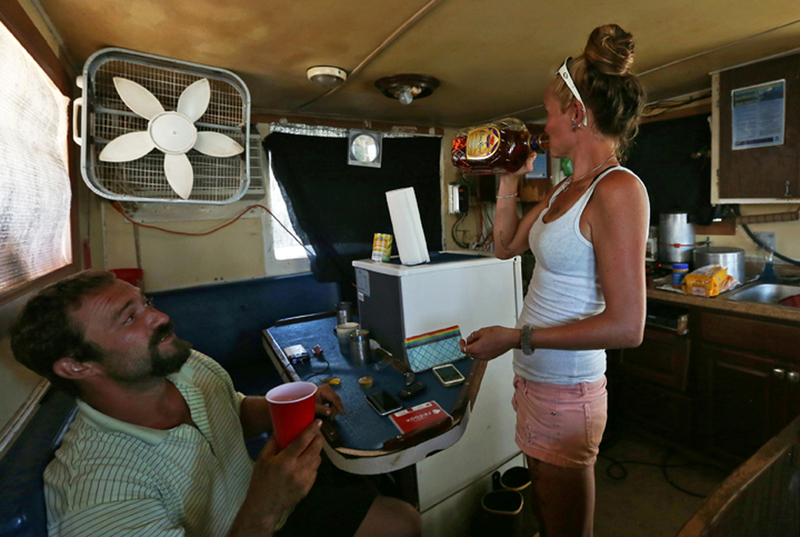 Captain Todd Beland, left, watches as First Hand Stasia Hudson, takes a swig of whiskey from the bottle as they wait for their catch to be processed in Hampton. Beland sits in the booth where the body of their 5th crew member, Timmy, laid for about an hour after overdosing while out at sea. “Can’t no-one hide from it”. Hudson says. Beland doesn’t allow use of drugs or alcohol until the ship is docked but couldn’t help his 5th crew member that night. 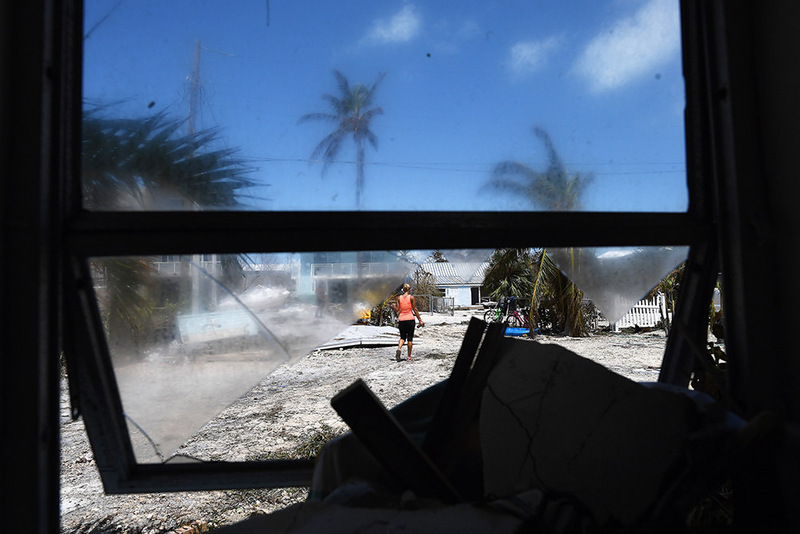 Ely Chavez works to clear debris from her home`following Hurricane Irma in the Tavernier area located in the Florida Keys on Tuesday September 12, 2017 in Tavernier, FL. The family was able to get back to see their home for the first time today. “Didn’t expect it to be this bad”, Ely’s husband, Kevin said while referring to his home. Forty years after his death, Elvis Presley is still very much alive in the hearts and minds of his many fans. 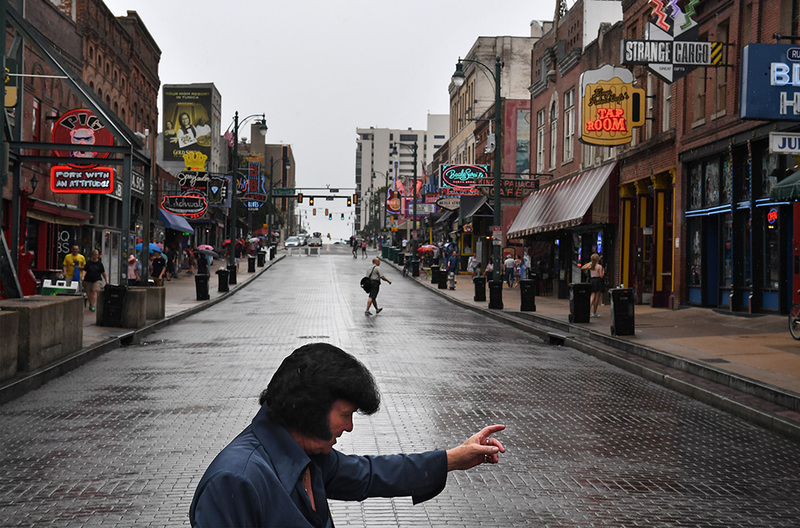 Countless of them made the pilgrimage to Memphis, TN for Elvis Week this year to mark the 40th anniversary of his death. Anglican Archbishop, Dorian A. Baxter of Newmarket, Ontario, Canada and Elvis Tribute Artist performs on Beale Street on Sunday August 13, 2017 in Memphis, TN. Baxter also goes by the name of Elvis Priestley. August 11-19 is Elvis Week. This year marks the 40th year since Elvis Presley’s death. 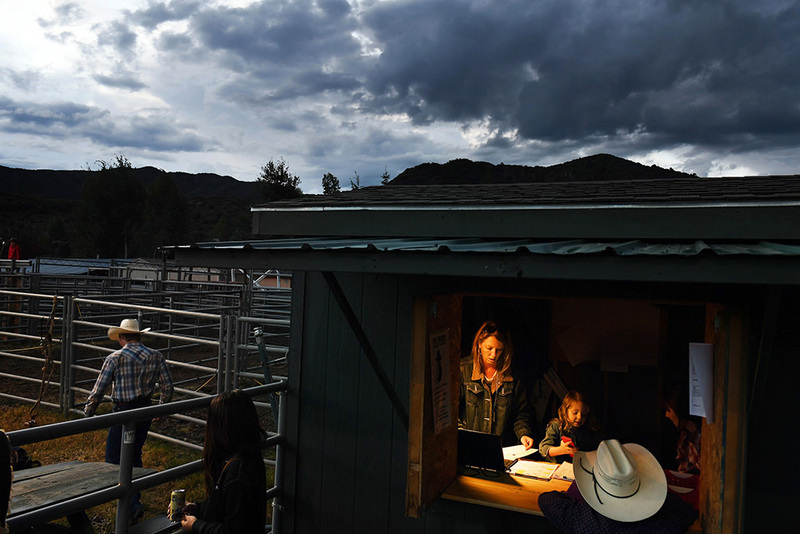 Katie Ford, center, is seen in a shed used for participants to sign up to compete and other rodeo business at the Snowmass Rodeo on Wednesday July 19, 2017 in Snowmass Village, CO. This is the 44th year for the weekly rodeo that runs from mid-June through August. 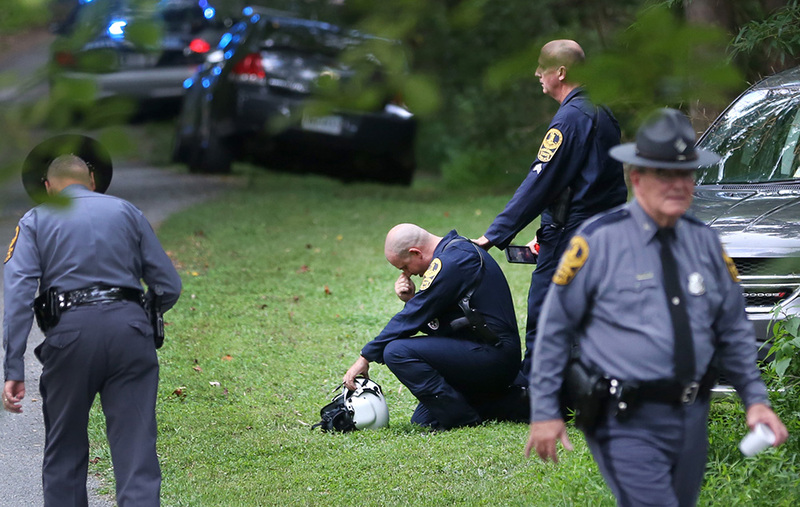 Authorities near the scene of the helicopter crash near Charlottesville on Saturday Aug. 12, 2017. Virginia State Police confirmed two deaths in the crash. 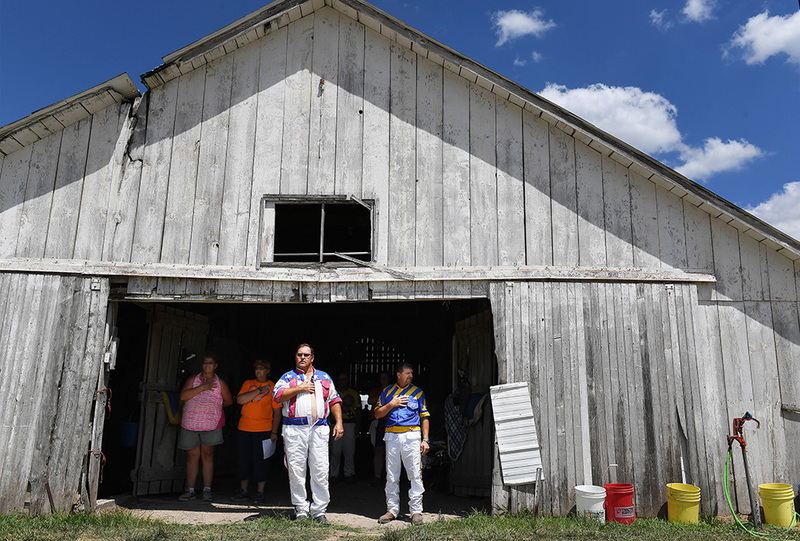 Rick Huffman, center, covers his heart during the playing of the national anthem as he gathers with others before the start of harness racing at the Clark County Fair on Sunday July 30, 2017 in Kahoka, MO. The fair, which began in 1881 featured a demolition derby, tractor pull, and livestock competitions among other attractions. There used to be several days of harness racing at the fair in the past, this year it was on one day. Huffman was competing in the racing. 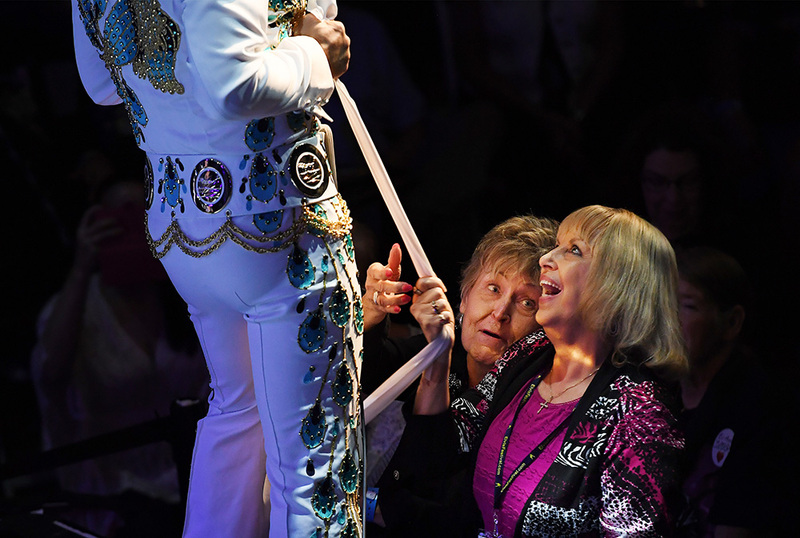 Linda Erwin, right, of Spartanburg, SC tries to secure a scarf from Elvis Tribute Artist, Diogo “Di” Light during the Images of the King World Championship at the New Daisy Theatre on Monday August 14, 2017 in Memphis, TN. August 11-19 is Elvis Week. This year marks the 40th year since Elvis Presley’s death. Comments: Chosen for immediate visual impact and emotion for each story. Each photo placed the viewer there, in the thick of it, which allows you to draw the reader further into the story. The decision between first and second was difficult. The image of the officer kneeling struck me because it was such a raw moment. It shows the brotherhood of the police officers, the toll the job has put on the man kneeling, and it communicated to me that something heart-wrenching just happened. 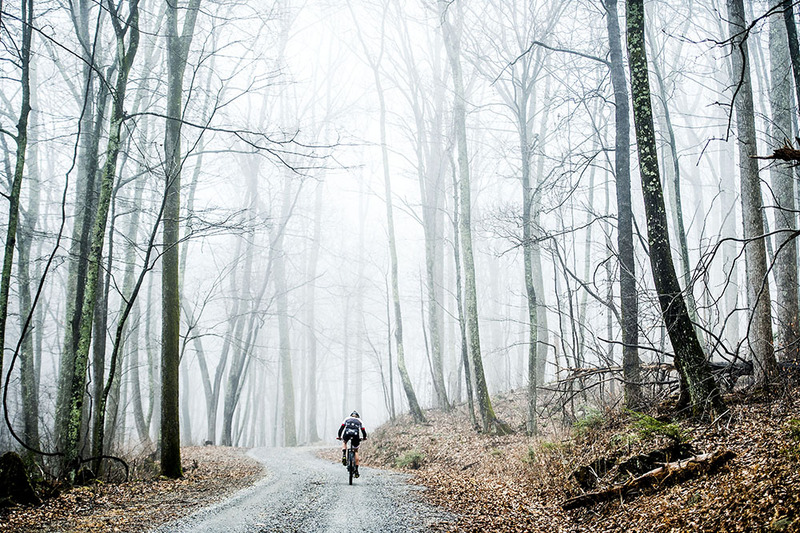 Not your typical sports photos-these each offered a unique perspective , in my opinion. All of them offer some beautiful contrast. First place was the clear winner to me. When I think of swimming, I don’t typically think of it as a team-based sport. But this image shows that the team’s support is just as important as the athlete competing. Wonderful job capturing the moment. Second place captured the intensity and focus of the football players. I like it because it is very true to the game of football. It’s not about looking pretty, it’s about doing everything you can to make the catch (silly faces and all). Third place is a very beautiful photo. Great eye and dedication to get up early and get the photo. Worthy of the top 3. I really loved that each of these made me want to either learn more or be there. First place very strong. It’s an interesting perspective, uncontrolled action, beautiful colors, and a technically sound photo. Beautifully done. First and second were very difficult to decide. I love the simplicity of this photo. The light coming through the door in contrast with the Spiderman outfit made me do a double take for sure. Very nice image. Third place was a very interesting photo. The composition made me want to lok closer to explore what it is that the workers do for a living. Very deserving of top 3. All of these were visually stunning and shot so well. Great light, composition and use of negative space. The tunnel man placed first because it showed his personality the best. His sense of style paired with the crossed arms convey attitude. But the colorful tunnel really brings it home. LOVE IT. Third and Second place were very, very close. The violinists were beautifully composed in the photo, well done. Really draws your attention in. 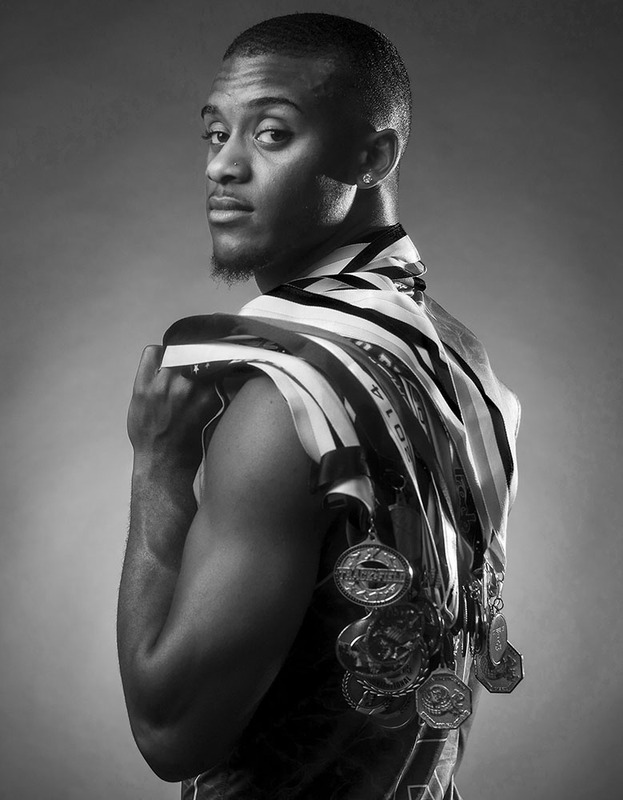 Third place was a very sound photograph that shows he is a talented athlete. Both photos are very literal in that it shows objects to convey what they enjoy. However, I’d like to see personality as well, which is what the first place photo did really well. Great series’ with intimate looks inside to the subjects lives. The rodeo has a solid diversity of images. Could tell you were thinking outside the box on some of the shots. You have a lot of strong images but more importantly, you had a coherent story that was easy to piece together through photos. Oher submissions also had good images sprinkled throughout, but were lacking story. Second place had some phenomenal photos throughout, but it was all over the place without any context. Each of these were emotional and really gave me a look at the people behind the story. Lots of fundamental issues here though (technically) especially with audio and pacing. This was across all entries.